Aplia Econ Blog: News for Economics Students: Larry Murphy: Hall of Famer, Champion, Economist? 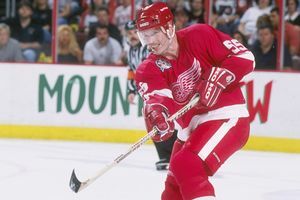 Over his NHL career, Hall of Fame defenseman Larry Murphy was praised for his reliable defense, gifted offense, and his immense hockey skill. But until now, I doubt he has been lauded for his economic insight. Perhaps even Murphy is unaware that his recent comments about head injuries in the NHL perfectly illustrate a real-world example of moral hazard. Speaking to an NHL.com reporter, Murphy explained current players rely on referees rather than their own decisions to keep them safe on the ice. "You always had to be aware of where you are in relation to the boards and you had to stay close to the boards and protect yourself that way," Murphy said. "Now the play is to turn your back to a guy and it's like, hands off.” While it may appear that Murphy was simply talking about how his sport has changed, his logic rests on the same clear principles economists use when analyzing many situations with the concept of moral hazard. First, let’s start with a bit of back-story for those not familiar with hockey. The rules of the game allow for a great deal of contact, called checking, during play on the ice. Legally, only the player who controls the puck can be checked, and contact is allowed anywhere on the ice, even near the boards. As modern medical understandings of head injuries and long-term brain damage have advanced, the hockey community, and specifically the NHL, has made efforts to further protect its players. In the past three seasons, a large emphasis in rule enforcement has been made to prevent hits from behind that would send a player head-first into the boards without warning. There is no debate in my eyes that the intent of this policy should be supported in every way. The economics in all this stems from the fact that players have begun to play the game differently due to a change in incentives. Murphy outlined how current players now take a more aggressive position on the ice because they no longer have to protect themselves; rather, the players know that the referees will protect them by calling penalties. From an economic standpoint, defensemen now face different incentives than they did before the rule change occurred. The risks associated with being hit from behind can be viewed as the cost associated with turning around on the ice. Since the new rules make those dangerous hits less likely, they essentially lower the cost defensemen face when deciding if they should put themselves in a vulnerable position. Economists refer to a moral hazard as any time a change in the larger economic system designed to protect an individual causes that person to alter his behavior to be more risky. Perhaps the most vivid illustration of moral hazard comes from a quip by an economist who realized that as safety features in automobiles have advanced, so have the number of accidents. He stated that technological advances that have reduced the number of fatal car accidents in the country (e.g. airbags, seatbelts, etc.) would be just as successful as removing all safety features from a car and installing a giant metal spike in the center of the steering wheel that would be sure to impale the driver even in a minor crash. While the comment is tongue in cheek, its underlying point is very valid. Consider if this alternate proposal were true. I imagine that drivers would be much more attentive when driving and make many more efforts to drive safely, such as reducing their speed and avoiding distractions like cell phones. Whether talking about new rules on the ice or safety changes on the road, the theme is the same: as technology changes the rules of the game to make people safer, they will respond by worrying less about risks and engage in more dangerous behavior. 1. Suppose the NHL is unhappy with the change in the style of play that has occurred since hits from behind have been more carefully officiated. What sort of rules or incentives could they introduce to continue to keep protecting players, but return play to the way it was before? 2. Consider the following scenario: A baseball pitcher is traded in the middle of the season. His previous team was the worst defensive team in the league. However, now he has been traded to the team with the best defensive players. In his first start for his new team, his coaches are baffled when he starts throwing many more aggressive and risky pitches that could be hit into play. How would you explain the change in the pitcher’s behavior to his coaches? What would you suggest they do if they want him to continue to pitch the way he did for his previous team? 3. Suppose the U.S. government passes new legislation that provides free healthcare to everyone in the country. As an economist, apply the principle of moral hazard to predict what will happen to the number of doctor visits that patients choose to make in a year. The intent of the change in the rules were to keep the players safe. To fell safe to turn their back on another player. This changes the strategies and the way the game is played, players know they will not be hit by behind, therefore take chances that if they are the other player would be penalized. Does it make the game more exciting? probably yes, they the players would take more chances, therefore scores would be higher. Does it take the excitement out, because the players know they won't be hit? Of course, I guess it is a give and take situation.